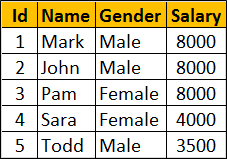 In this video we will discuss the similarities and difference between RANK, DENSE_RANK and ROW_NUMBER functions in SQL Server. Notice that no two employees in the table have the same salary. So all the 3 functions RANK, DENSE_RANK and ROW_NUMBER produce the same increasing integer value when ordered by Salary column. 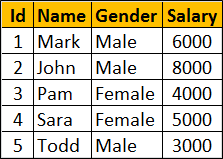 You will only see the difference when there ties (duplicate values in the column used in the ORDER BY clause). Now let's include duplicate values for Salary column. Notice 3 employees have the same salary 8000. When you execute the following query you can clearly see the difference between RANK, DENSE_RANK and ROW_NUMBER functions. ROW_NUMBER : Returns an increasing unique number for each row starting at 1, even if there are duplicates. RANK : Returns an increasing unique number for each row starting at 1. When there are duplicates, same rank is assigned to all the duplicate rows, but the next row after the duplicate rows will have the rank it would have been assigned if there had been no duplicates. So RANK function skips rankings if there are duplicates. DENSE_RANK : Returns an increasing unique number for each row starting at 1. When there are duplicates, same rank is assigned to all the duplicate rows but the DENSE_RANK function will not skip any ranks. This means the next row after the duplicate rows will have the next rank in the sequence.